Are you disappointed that the new Zelda game’s been delayed to March 2017? Well, I’ve got some good news for you. You can play the best Zelda of the last decade right now, and it’s not even made by Nintendo. It’s Evoland II, and don’t worry if you’ve never heard of it; it almost passed me by, too. I’m not quite sure why it’s received so little attention, especially since it hits many of the same notes as Undertale and beat it to the punch by nearly a month. Fortunately, we can correct that. 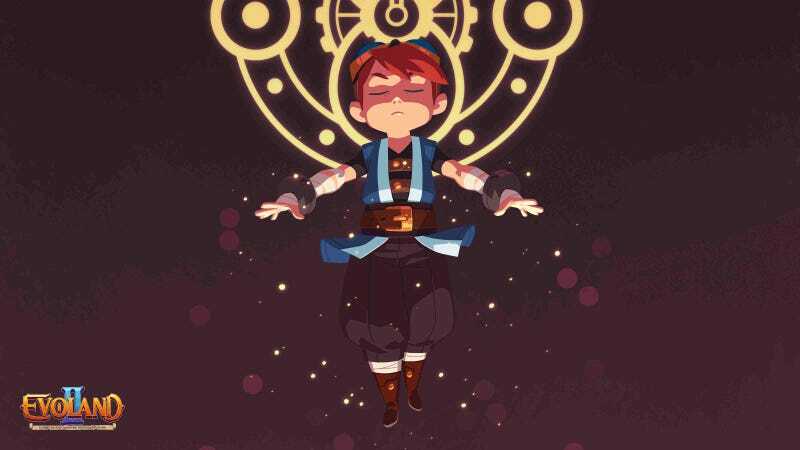 So, what is Evoland II? At first glance, it seems like a typical Zelda-inspired action adventure, similar to the well-received Oceanhorn. But it doesn’t take long before all comparisons are rendered void. Like the original Evoland - which is in many ways the Narbacular Drop to Evoland II’s Portal - EII jumps between different console eras, switching from a 16-bit art style to 8-bit to fully 3D. Each generation represents a different point in the game’s timeline, with the world changing in drastic ways over the 50 years that separates each generation from the next. At this point, EII is not so different from its predecessor. Sure, this time the generation-jumping is woven into a deep and surprisingly consistent time-travelling narrative, but if that was it I wouldn’t be here singing its praises. No, it’s what EII does on top of that that truly distinguishes it. Tactical RPG, bullet-hell shooter, Sonic-esque speedrunner, Double Dragon brawler, 1v1 fighting game, Guitar Hero rhythm game, Professor Layton puzzler, Collectible Card game, match-three battler, Final Fantasy active-time combat, R-Type side-scrolling shooter, Metal Gear stealth action, Donkey Kong vertical climber… And that’s not to mention the action RPG linking them all together, which has its own share of tricks up its tunic. These aren’t just token mini-games, either; each channels the classics of its genre better than many standalone titles. The turn-based tactics mode features troop recruitment, upgrades, and multiple approaches to its missions. The match-three battle mode has combo chains, spells to cast, and new gems that appear in later duels. The collectible card game mode includes wall cards, mana generators, and special abilities like first strike and trample - plus there are 61 cards to find throughout the game. What’s even more impressive is that not one of these modes overstays its welcome. They are each used only once - although some are repeatable if you’re craving more - which seems preposterous given how polished the mechanics are. The constant variety keeps EII feeling fresh for its 15-hour runtime, which is something that the Zelda games often struggle with - hence the rejoicing when The Wind Waker HD streamlined its end-game Triforce-shard hunt. EII bolsters its diverse gameplay with generous helpings of referential humour. Unlike many meme-laden attempts to leverage nostalgia, though, EII takes a more subtle approach, sprinkling winks and nods into the narrative instead of jumping up and down and shouting “Look, look! Remember this?”. You may not pick up on the homage to Back to the Future’s Calvin-Klein scene or chuckle over the fable of The Great Turtle, but at least you won’t have to suffer any tired “A winner is you!” wisecracks. Time travel. Humour. Multiple genres. Few games get any one of those right, but Evoland II nails all three. That’s why I’m not worried about Nintendo delaying Zelda: Evoland II proves that Nintendo is no longer the best even in its own wheelhouse. With humble studios like Shiro Games on the case, the future of our past is in safe hands.